The early 1960s was the era of nuclear apocalypse, the Bay of Pigs fiasco, school children practicing duck and cover tactics, and backyard fallout shelters (which BTW, are still popular with the ultrarich). Concern over survivability of nuclear radiation was big business for both the civilian and government / military communities not just for food, medicine, breathable air and potable water, but for electronics as well. After all, being cooped up in your subterranean universe for weeks or months while waiting for the outside environment to be habitable could be awfully lonely without some method of contacting other survivors. Consequently, much work was conducted to characterize and quantify how various forms of radiation affected electronic components. As you might expect, semiconductors, electrolytic capacitors, carbon resistors, and similar components that feature very small spacing between neighboring compositional particles are the most vulnerable. 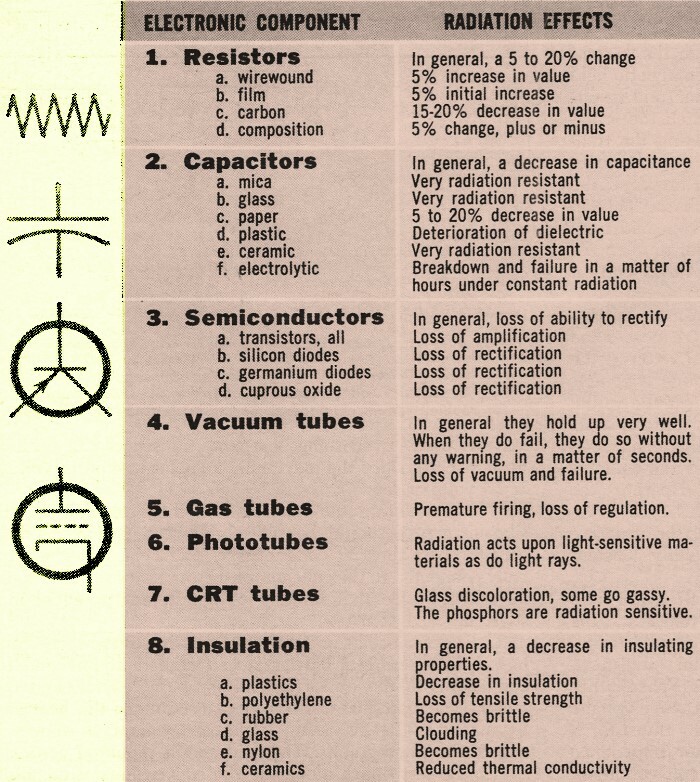 Wirewound resistors, crystals and, notably, vacuum tubes are amongst the most tolerant of radiation. That is largely why even modern-day Survivalists insist on vintage radio gear and pre-electronics trucks to supplement canned and vacuum-sealed food caches and large arsenals of weaponry. Concerns for nuclear catastrophe survival are even more important today because of high altitude flight and space operations that are subject to forms of both ionizing and non-ionization when operating outside (or near the edge of) the protection of the Earth's atmosphere. Rad-hard (radiation hardened) components are big business for military and commercial equipment. 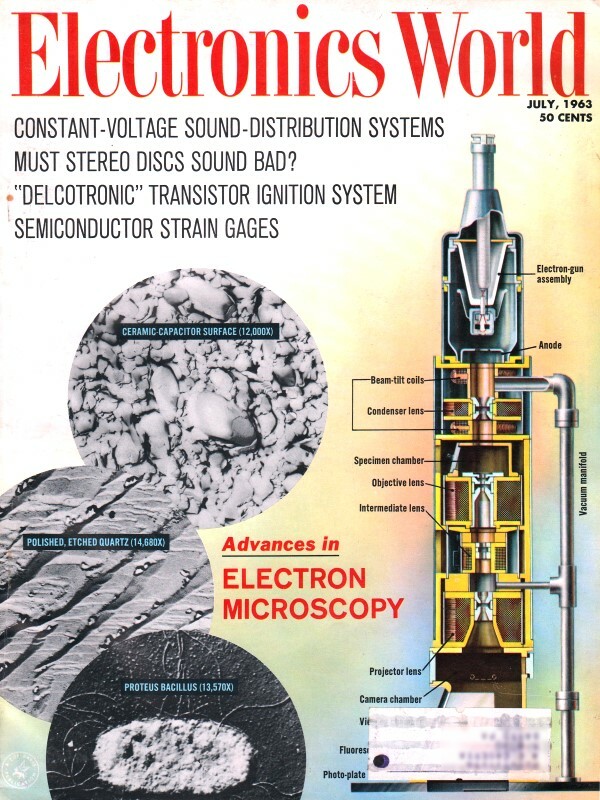 What happens to a capacitor, transistor, or vacuum tube when exposed to nuclear radiation? Here is what investigators have learned about this problem. Table 1. The effects of radiation on various commonly used electronic parts. Tremendous amounts of money are being spent by our government to determine the effects of nuclear radiation on electronic components and systems. The Defense Department and the National Aeronautics and Space Administration have spent over $150-million on this problem in the past few years. Much of this research has been concentrated on the exposure effects on equipment operated near nuclear reactors - such as are used in our atomic submarines. Other tests have been equally important. If a missile or aircraft passes through an atomic cloud, the electronic equipment is exposed to intense gamma radiation. The effects of this radiation can be great enough to cause the missile guidance system to malfunction or the navigational equipment in the aircraft to fail. Receiving and transmitting equipment, radar, fire-control systems, and computers all can be damaged by nuclear radiation. We must know how to counter this danger by using radiation-resistant components and adequate shielding. Practically all materials will sustain some change in a radiation field due to the action of the radiation on the atomic and molecular structure of the materials. The degree of change is a measure of the radiation damage and is a function of (a) type of material, (b) type of radiation, and (c) amounts of radiation particles and their energies. As radiation particles travel through a material they transfer part of their energies to the electrons and nucleus of the material and rupture the chemical bonds, producing ionization and atomic displacement. For example, proton damage to a transistor consists of ionization and impact damage. After exposure to large amounts, the current gains of germanium transistors have fallen from 70 to less than 20. Some electronic components hold up very well under intense radiation, among these are the vacuum tube, ceramic and mica capacitors, copper wire, transformers, and printed-circuit boards. Air entry is the most common cause of vacuum-tube failure and is due to the deterioration of the envelope seals. Insulation will deteriorate in a radiation field long before the conductor material is affected. Ceramic and mica capacitors show almost no change in ratings although due to disassociation and disorder produced in the molecules of the dielectric, there is a tendency for all capacitors to decrease in capacitance when subject to radiation. Since the same types of components are used in our civilian commercial equipment, the conclusions reached by investigators will be of interest to everyone in the field of electronics. Although the exact gamma spectrum from a nuclear blast is not precisely calculated, it may be assumed that all electronic equipment within the line-of-sight radiation area will be affected to some degree. By the time the nuclear radiation reaches the electronic system, the energy spectra will have been modified to some extent by passage through the atmosphere. It is known that at lesser radii from an atomic detonation there are proportionally greater energy gamma rays than one would expect at greater radii. Gamma rays lose their energy mainly by Compton scatter, photoelectric absorption; and pair production. Before we discuss the effects of radiation on electronic equipment, let us find out what types of radiation we have to deal with. Radiation can be divided into two groups or types: (1) charged particles - electrons and protons and (2) uncharged particles - neutrons, gamma rays. For measuring gamma we use the roentgen as the unit of measurement. The roentgen is defined as x-ray or gamma radiation producing, by ionization, 1 ESU (one electrostatic unit of electricity) in 1 cc. of air. For measurement of neutron radiation we use the NVT or number of particles present in unit volume, multiplied by their velocity (N * V * T). Among the most radiation-sensitive components we find the transistor. Loss of alpha, an increase in leakage current, and barrier failure are common. Other semiconductors, such as germanium, silicon, and cuprous oxide diodes, all fail in a radiation field through loss of rectification qualities. Radiation destroys the barrier until the diode acts as a mere resistance in the circuit and conducts in both directions. Depending on the intensity of the field, this may take from 1 to 20 hours. The time factor varies with the type of diode. Oil-paper capacitors have their plates expanded and may burst and short out due to the gas generated by the action of radiation upon the oil or wax. Resistors may change in value as high as 24 per-cent. Table 1 illustrates the type of damage done to the most common components. As investigation continues, many new problems will be highlighted and design changes made in vital equipment used by business, industry, and the military. Already certain recommendations can be made in the design of equipment. Inorganics should be used whenever possible because of the instability of organics when subjected to radiation. 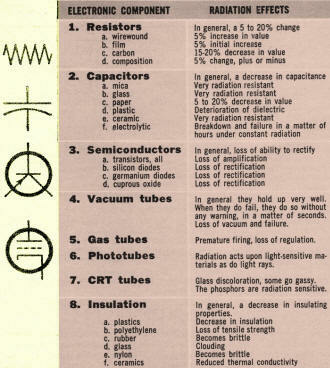 In certain applications, the substitution of vacuum tubes for transistors will have to be made. Some equipment must be made to function with wider voltage tolerances. Some types of lightweight shielding should be designed to minimize radiation damage. Many of the problems are in the process of being solved by NASA as it extends its space program and more electronic equipment is being packed into each payload that has to pass through the Van Allen radiation belt where the delicate subminiature instrumentation can be seriously damaged by radiation. 1. Van Allen. J. and French, L.: "Survey of Radiation Around the Earth," Iowa State University, January 1959. 2. Pigg, J. and Robinson, C.: "Radiation Effects in Semiconductor Devices," Proc. Transistor, New York University Press, 1956. pg. 77. 3. Zeigor, H.: "Radiation Effects Upon Electronic Components," Journal of Physical Chemistry, June 1961.